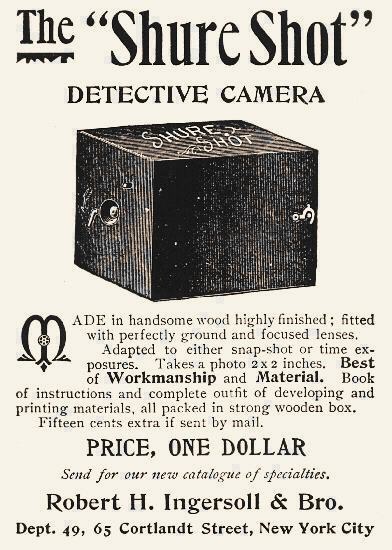 The Cheapest Snapshot Camera In The World These are the words boldly printed on the side of the box for the Shure Shot Detective Camera sold by Robert H. Ingersoll & Bro., of New York. The Shure Shot is definitely an inexpensive camera that lives up to its billing. It's tiny, cheap, and has no viewfinder or other features. It's nothing more than a 3" x 3" x 3-7/8" polished wood box with a meniscus lens and simple spring shutter at one end and a removable back for 2½" x 2½" glass plates. The camera was advertised around 1897 for $1. 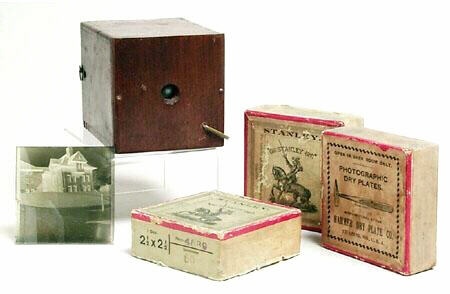 Although advertisements proclaim the camera made 2"x 2" photos, there are no examples of that format known in collections. Ingersoll also made a 3¾" x 3¾" model and "Improved" black leather covered version. Shure Shot Detective Camera, c.1897 Robert H. Ingersoll & Bro. NY. Robert H. Ingersoll is best known as a successful mass marketer that issued catalogues of $1 "specialties." One of his best-known and popular items was the "Yankee" watch introduced in 1892 with the Waterbury Clock Company. This was the model that made watches popular with the masses. By 1916 Ingersoll was making 16,000 watches per day and ultimately sold 40 million Yankee Watches. Their slogan was, "The Watch That Made The Dollar Famous." Could this same strategy have been Robert Ingersoll's vision for cameras? Was it Ingersoll's intent to further popularize photography by bringing a cheap $1 camera to the public? The idea definitely had merit but George Eastman had already brought photography to the masses with his historically important "Kodak" rollfilm camera. Although Eastman's pre-loaded rollfilm Kodak cameras were bigger and a more expensive, they were more convenient to use. On the other hand, Ingersoll's camera could only shoot one glass plate at a time and each plate had to be developed by the owner. Ingersoll continued to make cameras for years and introduced the famous "Mickey Mouse" watch in 1933. It is widely believed that Robert H. Ingersoll & Bro. eventually merged with other companies to become the Timex Corporation. Ingersoll Shure Shot Camera with dry plates. Source: McClure's Magazine, January 1897.